Selecting your kitchen countertop isn’t as hard as naming your first born, but it’s darn close. Unlike wall colors and sofa patterns which can be easily switched out, your kitchen countertop is a much more permanent fixture in your home. And, it plays a huge role in your kitchen’s palette. With so many kitchen countertop options out there, discovering that perfect one for you can be difficult. However, there are two main factors that will guarantee you’ll pick a countertop you’ll love: select a countertop that immediately speaks to you and one that will withstand the wear and tear of your kitchen’s everyday activity. Incredibly durable and stain resistant, this natural countertop option can give your home an edgy look. 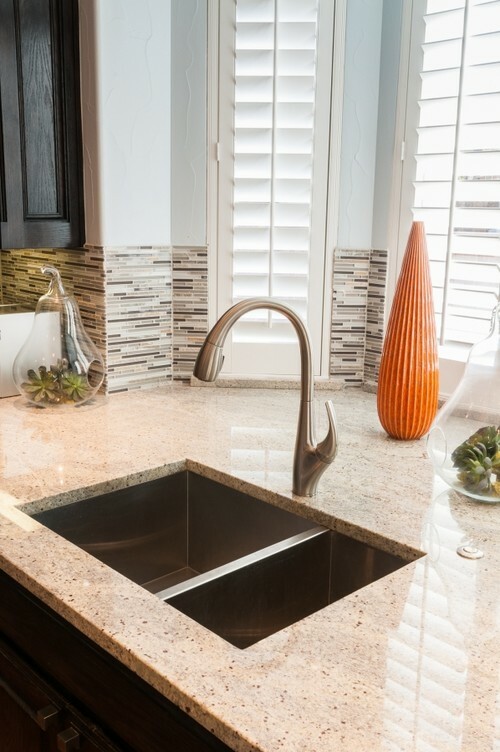 Granite’s popularity has skyrocketed over the years and for good reason. As a natural stone, it offers a wide variety of colors, grains and customizable finishes which deliver a sense of sturdy elegance. For the kitchen which isn’t common, copper is a great option. This easy to clean countertop is constantly changing as the copper reacts to different substances. This stain, acid, scratch and impact resistant quartz surface is one of the most durable kitchen countertops on the market. Additionally, it contains a unique bacteriostatic formula which prevents the propagation of bacteria. Similar to copper, wood is not a traditional countertop. Many worry it won’t stand up to the constant water. However, wood countertops that are made of high-quality wood and sealed correctly can be a warm addition to your kitchen which will last for years to come. What are other kitchen countertop options available? Contact Stephanie Kratz Interiors today.